Discussion in 'Packs, Bags & Pouches' started by J. Pierce, Mar 3, 2018. Eagle has landed. I am very happy with the quality and the service I received. That multicam is super nice! Seeing the padded strap makes me pretty sure that I need one too. The padded strap is nice, but it's definitely stiff. I'm hoping it will soften up a bit with use. Yeah the Multicam Tropic turned out really nice and I'm glad I went with it. Gotta love Mark, he made a model no longer made, in material he technically didn't have yet, and then charged me less than he should have because he didn't feel like finding a calculator. chndlr04, M.Hatfield, La\\//inci and 2 others like this. I didn't think about the strap being stiff, but I'd think it would break in with same use though. He is a passionate craftsman, a sincerely great guy. I'm still surprised these Scout carriers didn't get more of a following, I think they are the perfect setup. The Mother is slick, but just to big for my use. I'm glad to see you got one, I think you're gonna like it. M.Hatfield and Kona9 like this. Mark is going to the top. 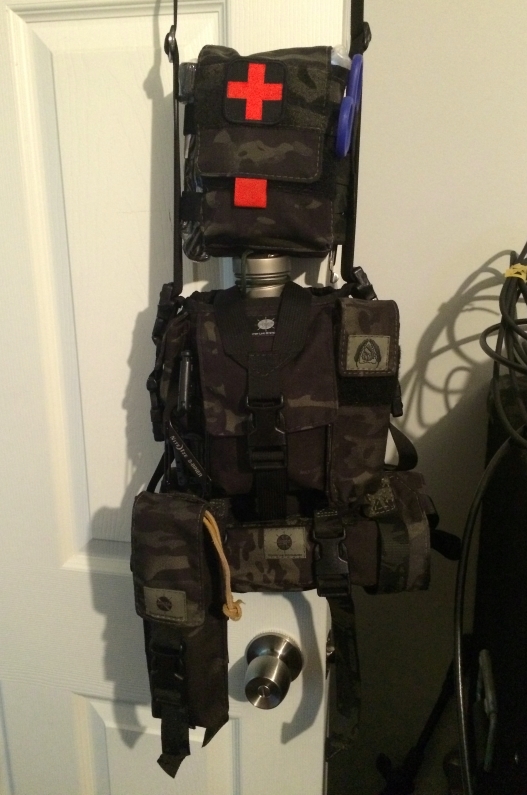 I own a scout and several other pieces of his gear. I plan to buy more, take my money Mark. My scout load-out is a 40oz klean kateen, lid, nested GSI cup, fish mouth spreader cup/bail, some tea bags, instant coffee, a flask of Baileys Irish Creme or Monkey Shoulder whiskey, compass, ranger beads and 25’ of cordage in the padded shoulder strap. I love my scout. I’ve been carrying it just over a year now and have had no issues with it in several hundred miles in the woods of the northeastern forests. I often pair it with a Mystery Ranch Load Cell which I also love to carry in tandem with my scout. M.Hatfield and J. Pierce like this. That's a nice looking setup! I think I need to have Mark make me a padded strap too. When I ordered mine I didn't see a need for it, but I forgot how much a 40 OZ container of water weighs. In the winter I don't notice it, because my jacket is my padding, but it would be nice to have in the summer. Odinborn, La\\//inci and M.Hatfield like this. crap look what yall did! carnivor way, J. Pierce and M.Hatfield like this. I have been browsing the Centerline Systems website for an hour now. Anyone have a suggestion what would be best for a minimal day hike? The Scout or The Mother? blind & lost and J. Pierce like this. blind & lost and M.Hatfield like this. woodsranger, blind & lost, J. Pierce and 1 other person like this. Thanks for the quick response. I think The Mother might be my go to. I drink more water than normal and like to have a small camera and some snacks on quick day hikes. I have actually found a haversack or backpack a bit too much for my local areas. I am betting The Mother could be the perfect small size. M.Hatfield and chndlr04 like this. Inside the scout in this picture is a firebox stove, Nalgene, and nesting cup. Plus a small fire kit and a flashlight. Lots of room in the scout. Jacob, chndlr04, J. Pierce and 1 other person like this. Maybe the Scout will ride on the EDC belt I have from them. The Mother might be a more self contained package. Time will tell. Speaking of, do you think this might be a great thread to share ALL Centerline Gear? Jacob and J. Pierce like this. I'm more than happy to do what I can to help support Mark and Centerline. I think I can edit the title to make it easier for everyone to find too. Jacob and M.Hatfield like this. That dump pouch is a nice idea, especially with spring foraging coming up. At least I hope it's coming.......eventually at least. Heck, the web-store even has a picture of how I carry the two tools. Carries great on a belt! NevadaBlue, J. Pierce and Jacob like this. I’m in! Love this thing. Has been a constant companion in the woods and at work. It, or it’s contents get used just about every day. MAN (grrrrrr) purse! carnivor way, J. Pierce, Eric Westbrook and 2 others like this. I can not think of one other conversation in my life where a drill rig and a sailboat both came up as prime examples of the topic being discussed. Mark sent me this cool little tin a couple weeks ago. I still need to do something constructive with it, I haven't decided exactly what yet. Here is another use for the Centerline Systems Folding Saw Pouch. It has the pouch in the front, but on the back it has a sleeve, a belt loop, and a molly attachment strap. The Condor Primitive Bush Knife slips right into the sleeve part of the deal. tobiism, Jacob and M.Hatfield like this. But, your water bottle is upside down. Is that to keep the cork moist? I don’t need any more gear. ARRGGG, but I need that! Jacob, M.Hatfield and J. Pierce like this. When it's cold carrying the bottle inverted help keep it from icing over right at the mouth. You can bust out a skim of ice with a dirty stick or a grubby knife, but if I'm gonna drink tea I prefer it to be on my own terms. Jacob, blind & lost and M.Hatfield like this. Nice photo of it in its natural habitat! Jacob, M.Hatfield and BradGad like this. As someone else said, I used to go on day hikes with nothing else but a water bottle and a sandwich. I hate fanny packs, so often it's been food in pocket and water bottle in hand, which is less convenient. The Mother is next my list. May get it now, or wait until payday. I already got the HC canteen kit and tthe titanium Firebox Nano to go with it. Whatever else goes in it, I think will vary, but it would be a fun pack to use as basis for a small survival kit. No reason to go nuts with it, just add those few things that you know from experience would have been nice to have and a bit of medical + fun. M.Hatfield, Jacob, J. Pierce and 1 other person like this. Here's mine, Mother and G2 Roll (Strap pad not in photo). Still haven't had it out yet, its a work in progress. BradGad, Jacob, J. Pierce and 1 other person like this. cabba2203, BradGad, Jacob and 1 other person like this. 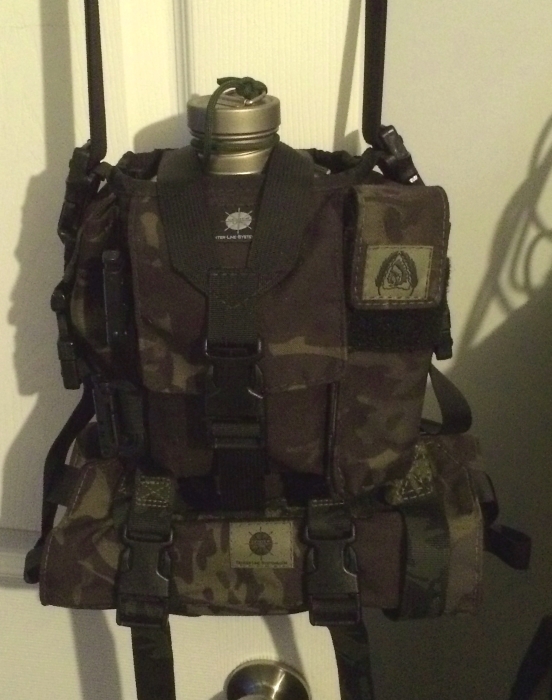 I forgot to add in my CLS Saw pouch as well as my BSS IFAK pouch that CLS makes for them, same as the FLUTE flashlight pouch I have mounted on there. I was going through a MultiCam Black frenzy. LOL! But that's the full system I am assembling - I have the strap pad on it as well but not in the picture. It's MultiCam Black too. HK Forest, Jacob, blind & lost and 2 others like this. It's official, you're a CLS junkie! That's a very nice setup. M.Hatfield, BradGad, Jacob and 1 other person like this. I bet you’ll like it, it’s big enough for some everyday stuff, everyday woodsy stuff and a bit of “survival” odds and ends in the bottom of the pockets. Kinda just the right size and really durable. It is an odd combination isn’t it? Useful anywhere though, except maybe around town. Business owners tend to get grouchy when I start burning their landscaping for a brew-up. Thanks! Mark makes some awesome gear! Esbit tablets just might be the solution to all your urban problems? I think all these things, like my Sabra Partner, the Pathfinder kit, Breadbag, Mother G-1 and G-2 rolls all work as organizers and part of a system. I've decided to wait until next month and get both the Mother and G-1 roll.